This five reel, 100 pay line addition to online pokies offers you a Lion’s share of winnings with wilds, scatters and plenty of free spins. In this jungle styled game, you are immediately given the deep African atmosphere with the drumbeats and background music. The images also enhance the African jungle with gazelles, zebras, lion cubs, a lion and lioness and an intriguing African mask. In addition, there are some graphically colorful high value cards: Ace, King, Queen, Jack and Ten. The coin choices to play are only $0.01 and $0.02, but you can play five coins per line every spin. With 100 lines the maximum number of coins to pay are 500. Lion’s Pride is indeed a chance to win. 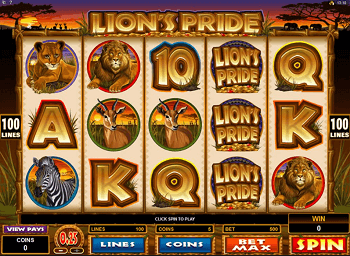 The Lion’s Pride Logo is the Wild symbol in this online pokies game. It substitutes for all other symbols except the Scatter Mask. Also, the Lion’s Pride Logo sometimes appears stacked on the reels and this adds to your Lion’s Share of winning possibilities. The Mask with the slitted eyes is the Scatter symbol. Two of these anywhere on the five reels will award you a payout equal to your bet. But three or more will trigger the Free Spins Feature, and this feature is what separates Lion’s Pride from all other online pokies. The trigger for the Free Spins feature is achieving three or more Scatter Masks across the reels. You are then randomly offered an amount of free spins which can be as much as 25. During the free spins, any wins are given random multipliers x2, x3, x5 or x10. With the possible stacking up of the Wild logo during the Free Spin feature, you can find yourself with a real Lion’s Share of winning coins. Like all online pokies, Lion’s Pride offers a Gambling feature in addition to all the others mentioned above. With any winning combination on the reels, you can click on the Gamble button and go to a second screen where you are offered a chance to either double or quadruple your win. If you pick the correct color between Red and Black, you can double your win. If you pick the correct card suit, you can quadruple your win. The Gamble feature is always a risk, but it is lots of fun. 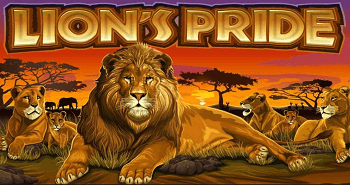 The Lion’s Pride online pokies game with its Lion’s Share of possible huge coin awards is one of the smoothest pokies games to join the online casino games. Try it now.